Season 2 of "city.ballet. "—the AOL On series that gives an insider's look at New York City Ballet—is live now! We're recapping one episode per week. Watch all 12 at dancemagazine.com. It's baaaaack! 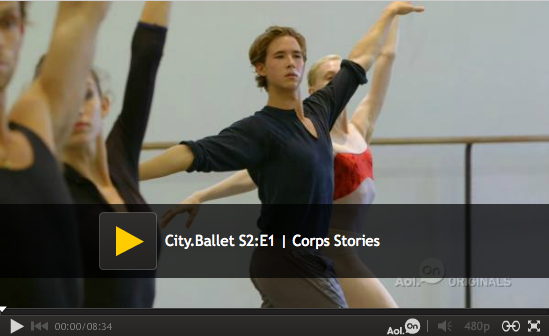 We couldn't get enough of the first season of "city.ballet."—drama! intrigue! pretty feet!—and have been eagerly awaiting round two, which finally, finally premiered yesterday. NYCB soloist Lauren Lovette in a still from "city.ballet." Corps Stories, the first episode of the second season, follows some of New York City Ballet's greenest dancers. Here are five things we learned form the ep. 1) There are 52 corps dancers in NYCB. FIFTY-TWO. Just in the corps. This company does not mess around. 2) Unity Phelan is the cutest ever. The 19-year-old corps member is just so happy to be in NYCB, and that makes us happy, too. "When I walk into the studio in the morning, I feel like a puppy!" she says. Most dancers complain about packed rehearsal schedules, but when Phelan has a long day, she thinks, "I get to dance so many ballets today!" D'aww. We also get to see her rehearse one of her dream ballets, George Balanchine's Agon, which is totally fascinating. 3) Corps dancer Harrison Ball lives like a monk. He isn't your average 21-year-old: His apartment has no TV, no AC and (gulp) no wi-fi. Dude is intense. 4) He also has the world's chillest, most adorable cat. Schmoop! 5) And he's come up with a very apt metaphor for the dancer's love-hate relationship with ballet. "Ballet is a person to me," he says. "I spend my whole day with this person. It can be so loving and embracing. But it can be mean sometimes, too. I fight with it, I fight against it. Sometimes I just want to choke it." Amen. Click the image below to watch the first episode of "city.ballet." season two!